Eye health – We recommend our extended Premium examination to our new patients and then again at subsequent appointments. This includes retinal photography which can reveal medical eye conditions in their early stages, so that – with the right management – we can minimise the risk of the drastic sight loss that may occur if conditions are left untreated. Our latest digital camera can also develop your risk of developing age related macular degeneration. At Patricia Hayselden & Partners, we conduct thorough NHS and private examinations in a friendly, relaxed atmosphere, taking the time to listen to your needs and to answer your questions. 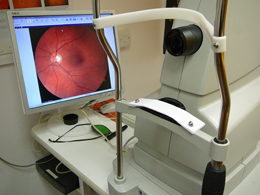 Our determination to provide the best care is also demonstrated in our investment in high-quality diagnostic/analysis equipment, such as our fundus camera and slit lamp camera. Some of our equipment might look scary, but it really isn’t – and it helps us give you the best possible measurement and examination. 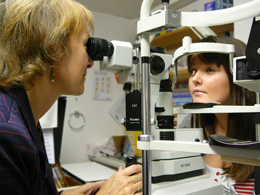 If you are diabetic, you will be advised by Oxfordshire Diabetic Eye Screening Service (ODESS), to have the blood vessels at the back of your eye photographed each year, to look for any eye complications, caused by diabetes. We are an ODESS accredited practice and the cost is covered by the NHS. 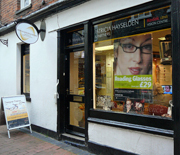 You can have this eye screening done as a separate consultation or as part of your annual eye examination.